The purpose of this article is to show you how to get bragging rights for a high SEO score and also use some of the information that you get back to help improve your website. There are quite a few tools on the internet that will all grade your website and give it a score, based on criteria specified by the grading site. The results are to be taken as a guide only and figures do change considerably depending on the grading site that you use. Your best bet is to go through all of them, make any recommended changes then benchmark your site with that of a competitors', using the same grading site and see how you compare. The following article will explain which sites are available for you to use and what you can expect from each one. 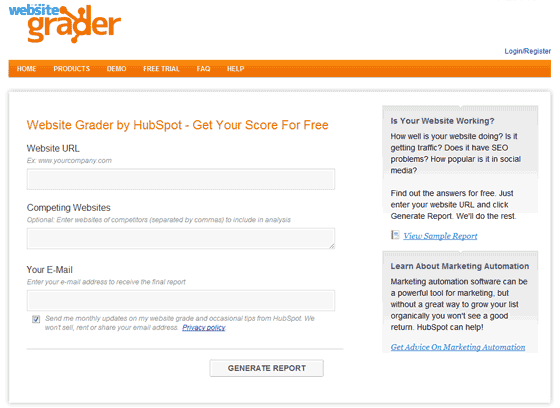 A pretty all-encompassing grading site that I personally use quite regularly is http://websitegrader.com/. On the main screen all you have to do is type in your website address and click on the generate report button. After about 30 seconds you will be presented with a report on your website and a Website Grade Score. Use this score as a guide but the higher it is the better as you will be conforming to current standards. Some of the information you will be informed about consists of the following. The information you see on this report is very valuable indeed. Nobody fully understands how Google’s algorithm works for ranking webpages, but if you ensure that you’re up to speed with all modern technology trends and social media techniques then you will remain current and relevant with modern search engine ranking techniques. So, just do as much as you can, and do it well! One final thing that has recently appeared on Website grader is a history chart for many of your website’s metrics. You can see the growth over the past 6 months for linking domains, MOZ rank, indexed pages and many others. Well worth a look for your site and your close competitors. Woorank is another website analysis tool that will interrogate your website based on its grading criteria - http://www.woorank.com. The website grading system on here could see your score drop by 30 points from the previous website grader one! Don’t be too disappointed if it does, just look out for any red crosses and see if there is anything you can do to fix them. It appears that W3C validation and having an error free site is an important grading factor here, as well as Microformats, Dublin core (really?) and Geo meta tags. This is not my favourite grading site as the scores always seem bizarrely low, but it’s worth a look all the same. There is not much on this site to monitor your on page SEO but the main points of information it gives are quite useful. Follow the steps below to gain some useful information about your website. Type your website’s URL into the search box and click on Search for Domain. Just have a fiddle with your site, make the necessary changes and these percentages should shoot up in no time.